Hour for hour, a Catalina Island vacation delivers one of the most relaxing getaways anywhere. Despite its location just twenty-some miles west of super-crowded Los Angeles, it is relatively unknown and uncrowded. 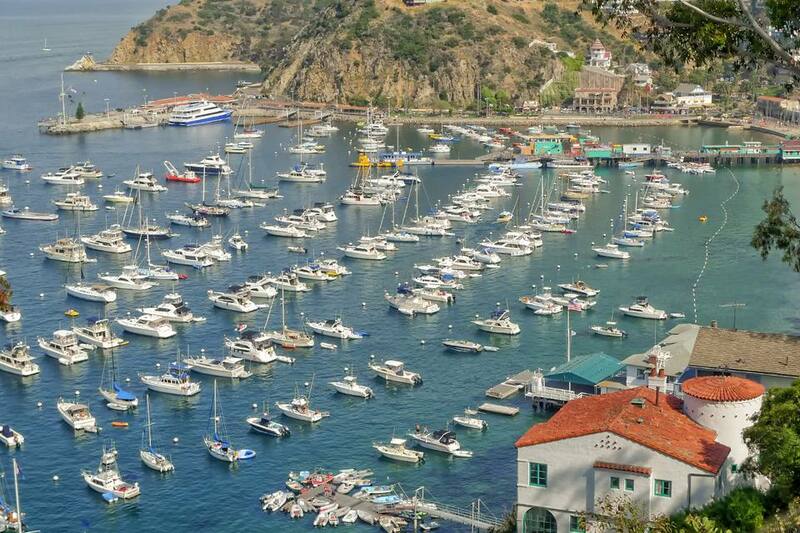 The most popular Catalina Island vacation spot, the town of Avalon seems almost enchanted. Things don't work the same way here as they do on the mainland. Fish fly. The grocery store delivers but the post office doesn't. The tower controller at the Airport-in-the-Sky goes out in his pickup truck to chase bison off the runway. There's a casino with no gambling and a bell tower without a church. As if the air were full of a mysterious relaxation potion, you begin to relax as soon as you arrive. Santa Catalina Island is small, 21 miles long, its narrowest point less than a mile wide. Elevations range from sea level to 2,000 feet. Coastal cliffs fall precipitously into the ocean and an encircling undersea ledge provides a rich habitat for marine life. There are only two towns on the island: Avalon, with a population of about 3,000, and Two Harbors, at the island's narrowest point. The rest is preserved in its natural state, thanks to a conservancy established by chewing gum magnate William Wrigley, the island's former owner. This guide is meant for a Catalina Island vacation in the town of Avalon, which is what most southern Californians really mean when they say they're going on a Catalina Island vacation. Most visitors travel by boat services which depart from Marina del Rey, San Pedro, Long Beach and Newport Beach. The fastest way to get started on your Catalina Island vacation is to take a helicopter. Private boat owners can sail (or motor) in, and private pilots can land at the Airport in the Sky and take a shuttle into town. Reserve a spot on the boat and a hotel room as much in advance as you can, especially in mid-summer or during any of the annual events such as the jazz festival. With a ten-year waiting list to bring a gasoline-powered vehicle onto the island, golf carts of all descriptions are the primary mode of transportation for residents and tourists alike. If you're up to it, Avalon is also a great walking town. If you're not, try the trolley service that runs from Pebbly Beach and the Casino up to the Botanical Garden. For such a small place, Avalon offers its visitors an eye-popping array of activities: you can explore them from the menu below, or use our Weekend Getaway Itinerary as a basis for planning your visit. In spite of all these tempting activities, a Catalina Island vacation usually includes a lot of simple relaxation. Be sure to do one more thing while you're there - take time to talk with an Avalon resident to find out what their life is like. Summer brings clear, sunny skies. Hotel rates are lower off-season (mid-September through April). Weekends are more crowded than weekdays, and Mondays are especially quiet.